I have a genuine appreciation for my readers so thank you for returning to Don’t Blink. You picked a good day to do it because it is the Thursday Rundown. If you are a rookie, that means five random topics are about to come your way. 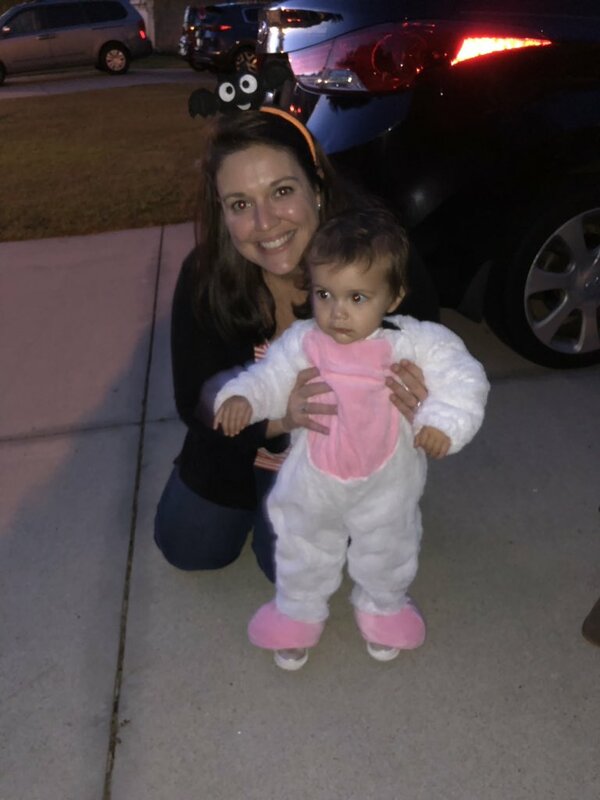 Cup On Head – I want to start the Rundown with a cute photo of Sloan. 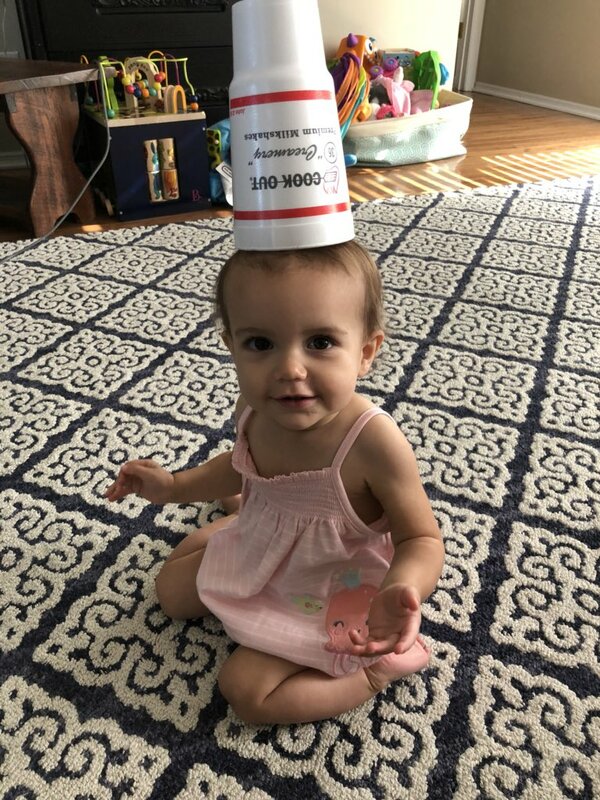 On Sunday, my daughter managed to put a Cookout cup on the top of her head. Not only did she look absolutely silly, but my sister-in-law made an interesting observation, saying that she looked like Abu from “Aladdin.” I don’t think the comparison was that far off. Sloan with a Cookout cup on her head. Does she look like Abu to you? 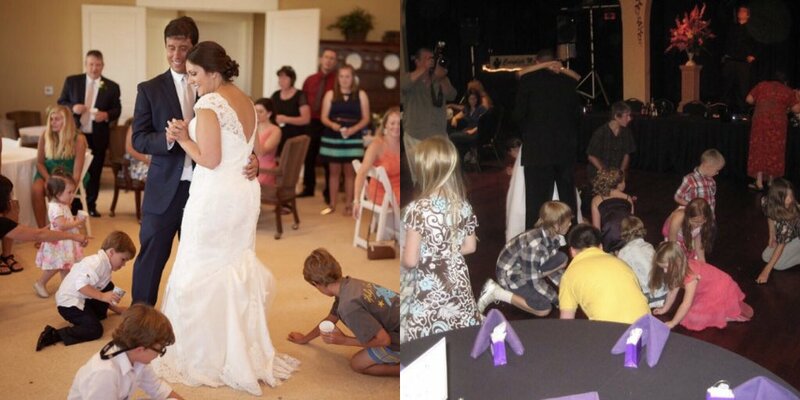 Coin Dance – Earlier this week, my sister and brother-in-law celebrated their seventh anniversary. As I looked through Timehop I saw many photos from the reception, including one from the best wedding reception tradition ever: The Coin Dance. An Italian custom, the coin dance occurs during a designated bride-groom dance. Wedding guests shower the dance floor with coins and all the kids in attendance rush to pick up the silver (don’t think about throwing pennies). Not only does it break up the monotony of a reception while giving the children something to look forward to, it also provides good luck to the bride and groom. Judging by my sister’s marriage and my own (Sid and I did it at our wedding reception), I would say those Italians got it right! A look back at the Coin Dance at both receptions of Sid & I and Miradan & Jay. 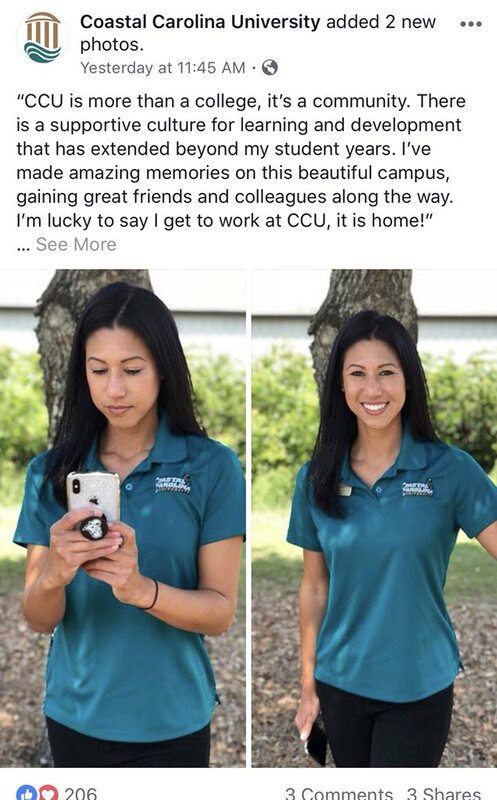 Summer Social Media Campaign – This week I was thrilled to introduce our summer #CCUSocialMedia campaign. With the PopSocket craze still going strong, I came up with something called PopCHANTet Texts. 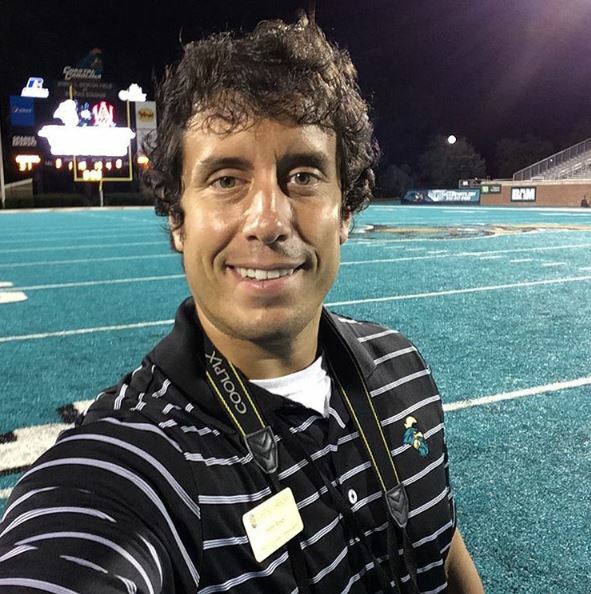 I am asking current students, alumni, and faculty/staff to describe what Coastal Carolina University means to them. However, they have to do it in 280 characters and I am encouraging them to write it as if they were sending a text message. For the visual component of the campaign, I am supplying each participating person with a CCU PopSocket to put on the back of their phone. 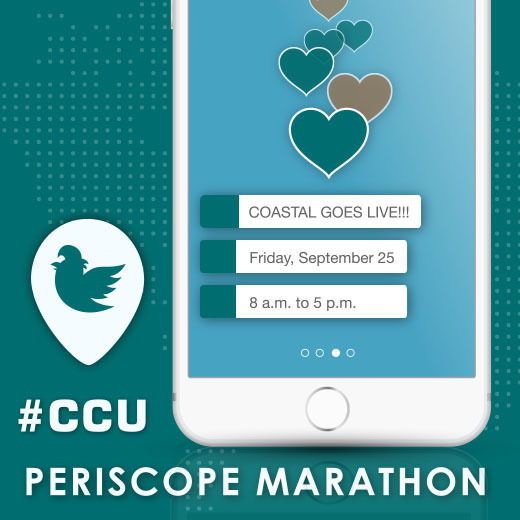 The volunteer will then have a person snap a photo of them as they “text” what Coastal means to them. See below or click here for what the final product looks like. My goal with PopCHANTet Texts is to encourage the CCU community to be frank and to the point about why they are proud of their university. I am excited about #PopCHANTet Texts! Lemonade? – I got wrapped up in a debate with Sid and one of my co-workers about a tweet I sent out a year ago. 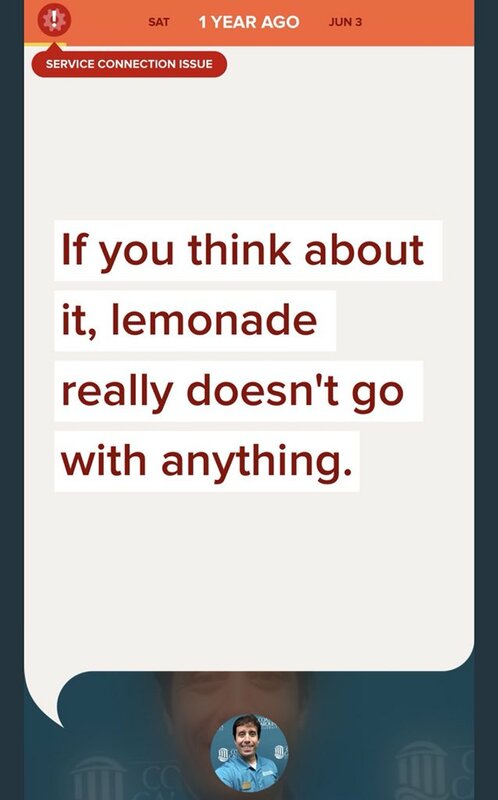 I had expressed my opinion that I don’t think lemonade really goes with any food item or meal. I concede that it is a thirst quencher on a hot day, but I would never pour a large glass of lemonade to go with my Mexican food or a steak. Geoff, my co-worker, believes it naturally goes with Chick-fil-A and apparently Sid thinks it goes with anything but I can’t agree. What do you think? This tweet that I sent on June 3, 2017, was debated again this week. 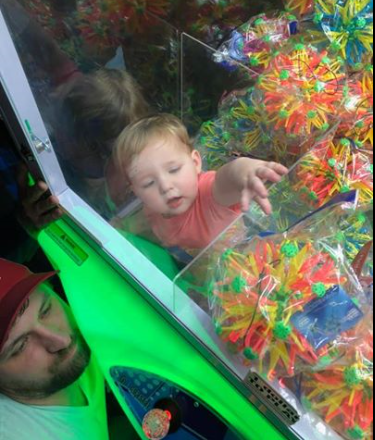 Knockoff vs. 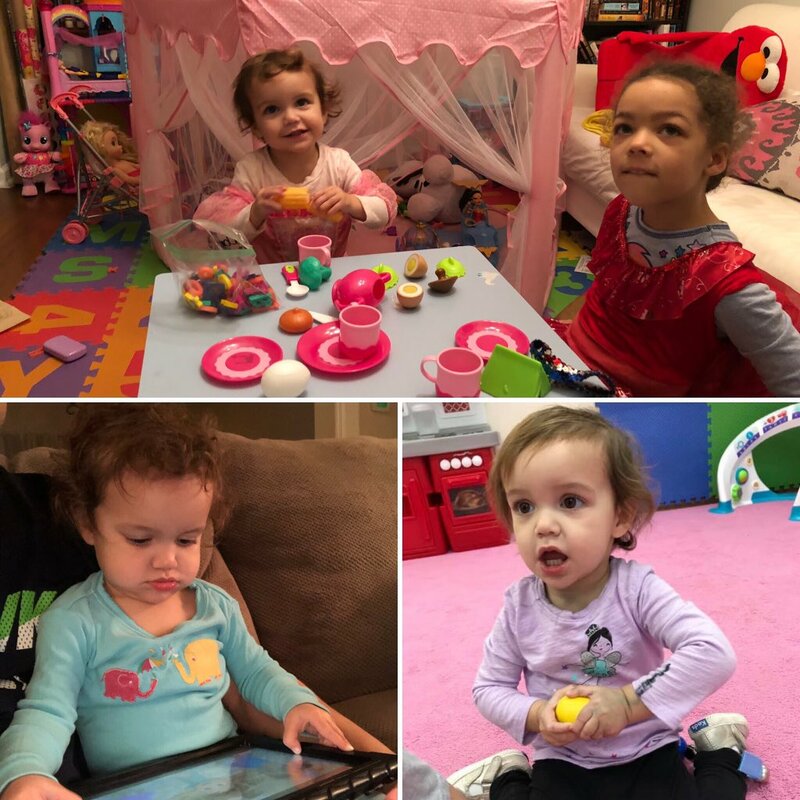 Premium – One of my personal favorite blog posts of all-time was written exactly three years ago when I had Sidney do a blind taste test of five products. Each product was represented by its premium version and a generic version. From snack foods to breakfast favorites to macaroni and cheese, I had Sid try all products and give me an honest assessment on what tasted better. I will say this: my wife’s taste buds are on point. I encourage you to read the post! 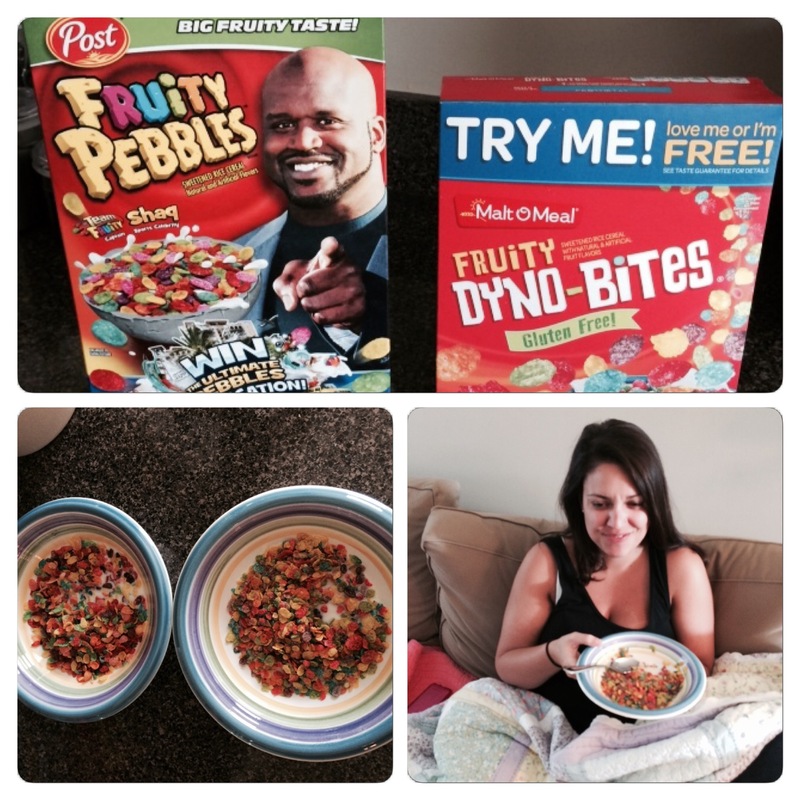 Sid sampled a popular cereal as part of the Knockoff vs. Premium showdown. To everyone attending the Carolina Country Music Festival this weekend, have fun! To all those who don’t live in Myrtle Beach and who have no idea what I am talking about — you have a good weekend too. Catch up with you soon. Don’t Blink. As a marketer, I am a firm believer in branding. My affinity for “establishing a brand” filters down to the social media program I am in charge of. 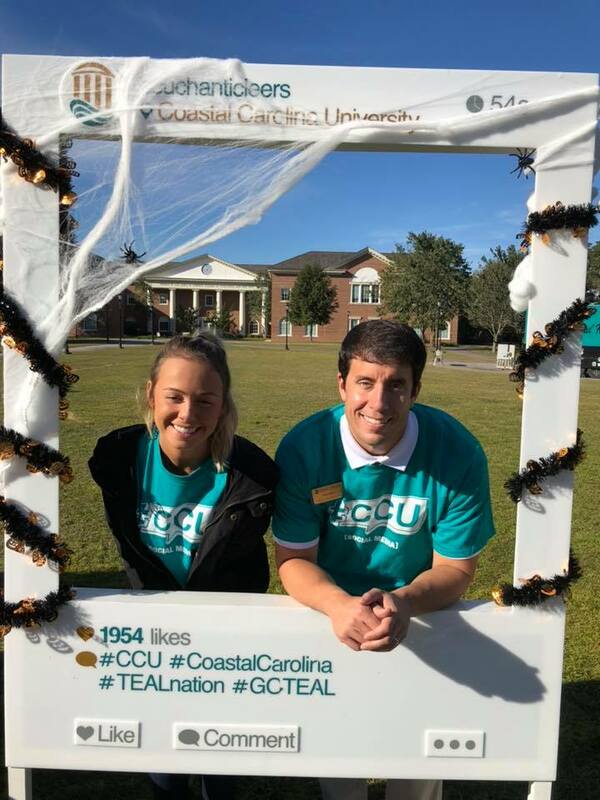 When I arrived at Coastal Carolina University, I wanted the campus community to know that the engaging and memorable content they were seeing came from an overarching source that stretched from our Facebook page to our Snapchat account to our LinkedIn profile to our various other channels. We confined our brand to a hashtag, #CCUSocialMedia. 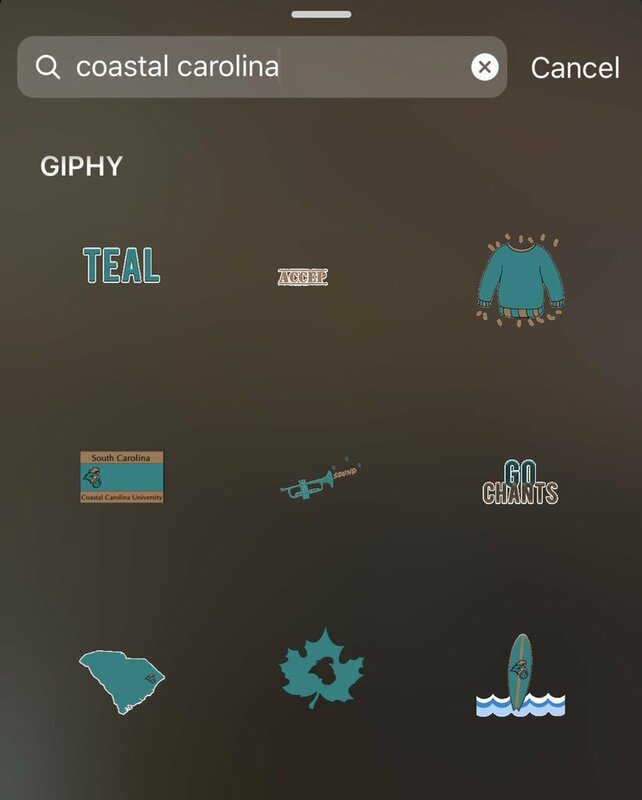 It didn’t take long for people to realize that if a piece of content was stamped with the tag, it meant that it was created by the University specifically for #TEALnation. 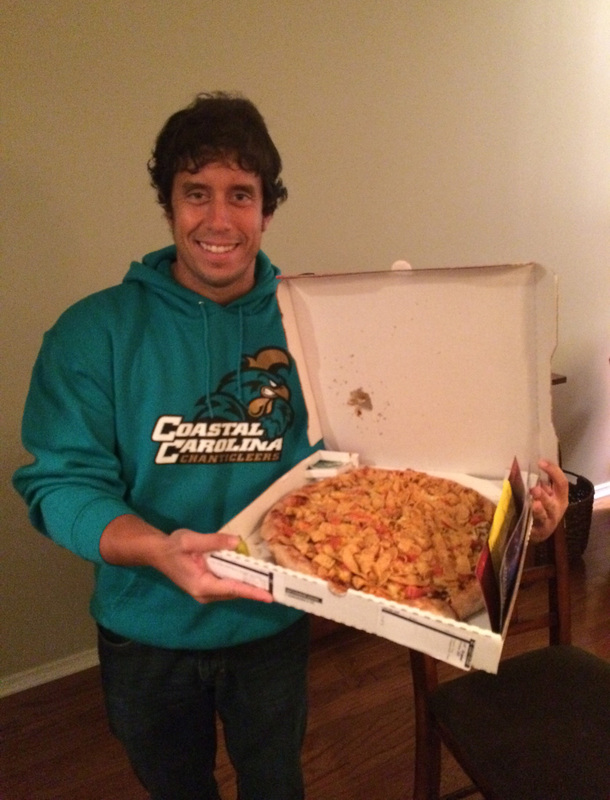 It was important to develop a brand for our social media program at Coastal. But how did we get word out about the brand? Well, we developed a website, came up with creative content, utilized brand ambassadors, and followed an organized plan. 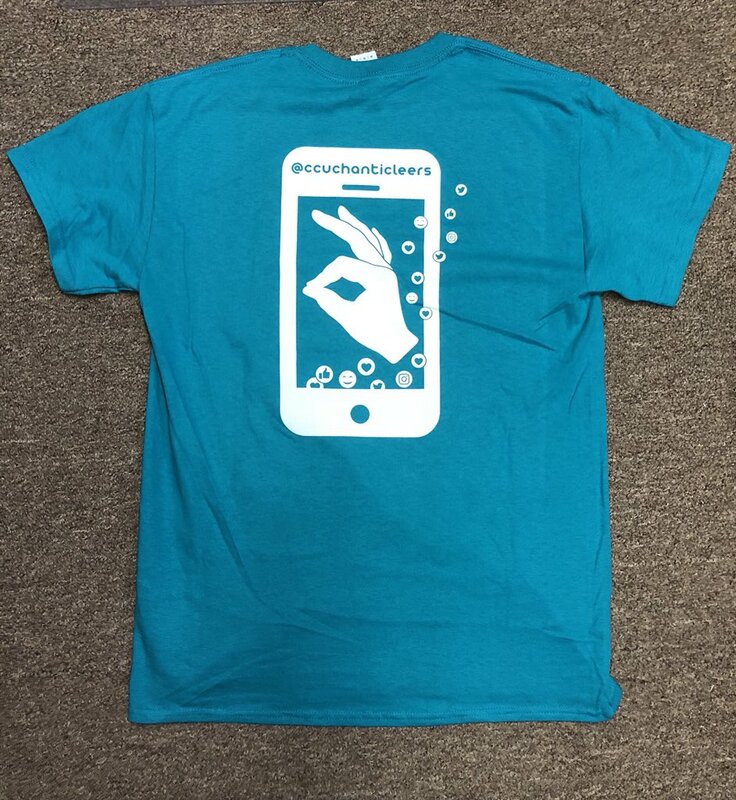 We announced our new #CCUSocialMedia t-shirt today. Thanks to Katie, my social media intern, for being a great model! 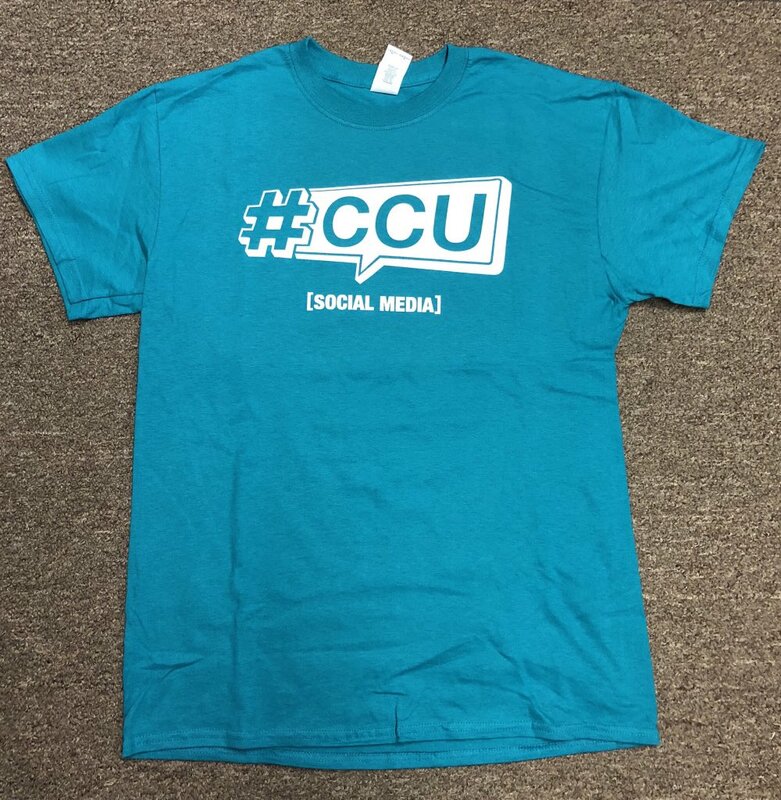 Yesterday, I picked up our newest #CCUSocialMedia t-shirts. Designed to reflect the current social media climate, this shirt is the third version in our program’s history. 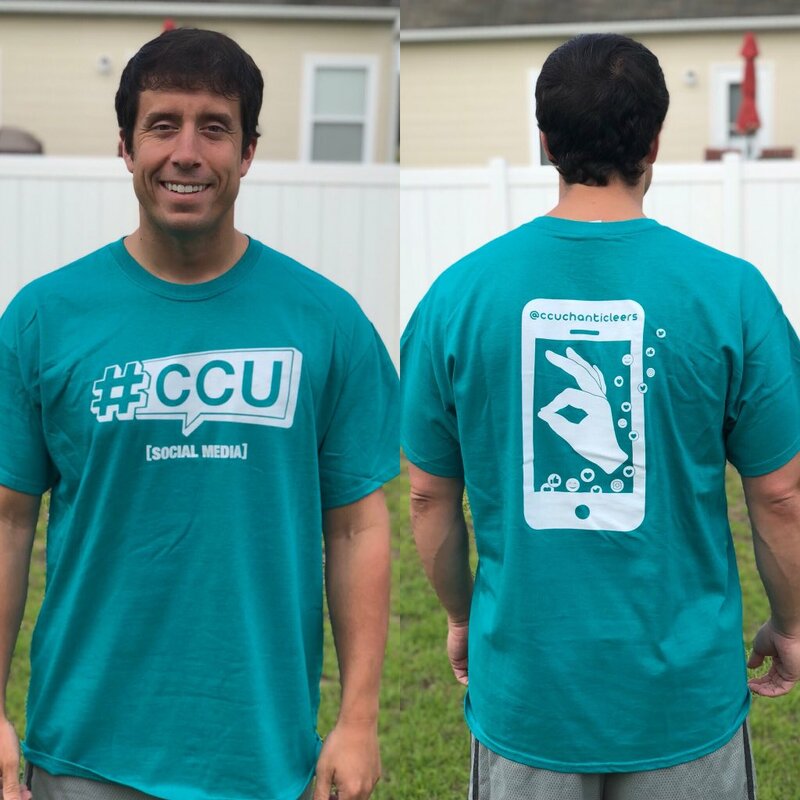 Me sporting the new #CCUSocialMedia t-shirt. The front is our brand. Actually, it is a 2-in-1. 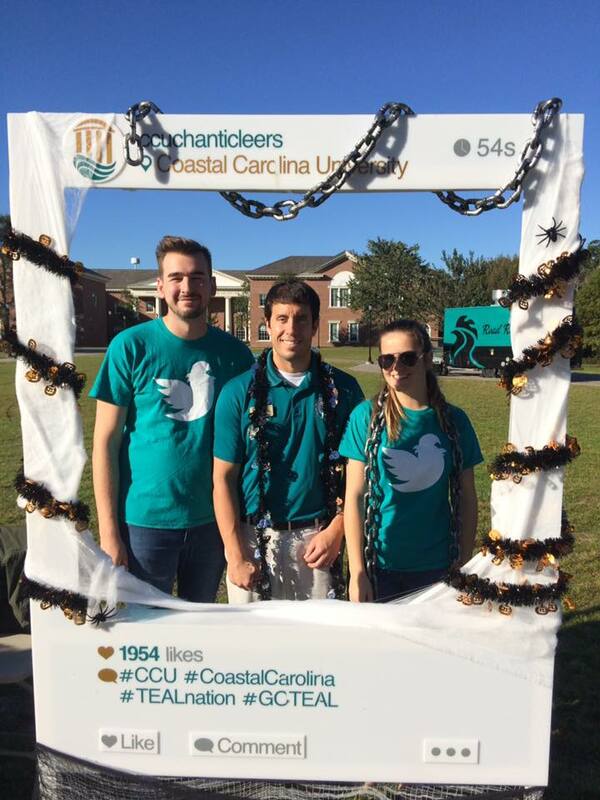 Not only does it contain our University’s social media logo but it also boasts our #CCUSocialMedia hashtag. Tricky, right? A logo that is, for all intents and purposes, your hashtag. The front of the shirt features our logo/hashtag and is to the point. But the back of the shirt is where it is at. 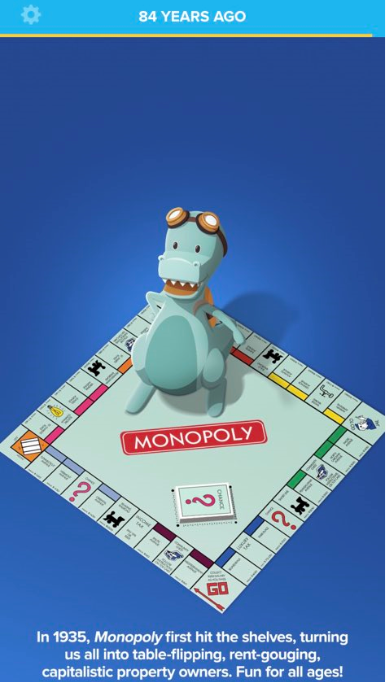 Ron Walker, a designer in our office, polished the concept I gave him and created something really cool. In a live streaming world obsessed with “likes” and “loves,” we knew this shirt would need plenty of hearts and smiley faces. He placed our increasingly popular Chants Up sign inside the screen of a phone marked with our social media handle (@CCUChanticleers). He then let the instant gratification flow as the reaction emojis begin at the bottom and hover upwards to the top of the shirt. I must say that Ron Walker did an extremely creative job designing this shirt. Will this shirt be as popular as our Chauncey inspired Twitter design? Talk about a difficult task! We didn’t re-order those shirts TWICE for no reason. But judging by the reaction on social media, I think these shirts will rival the past ones in terms of popularity. 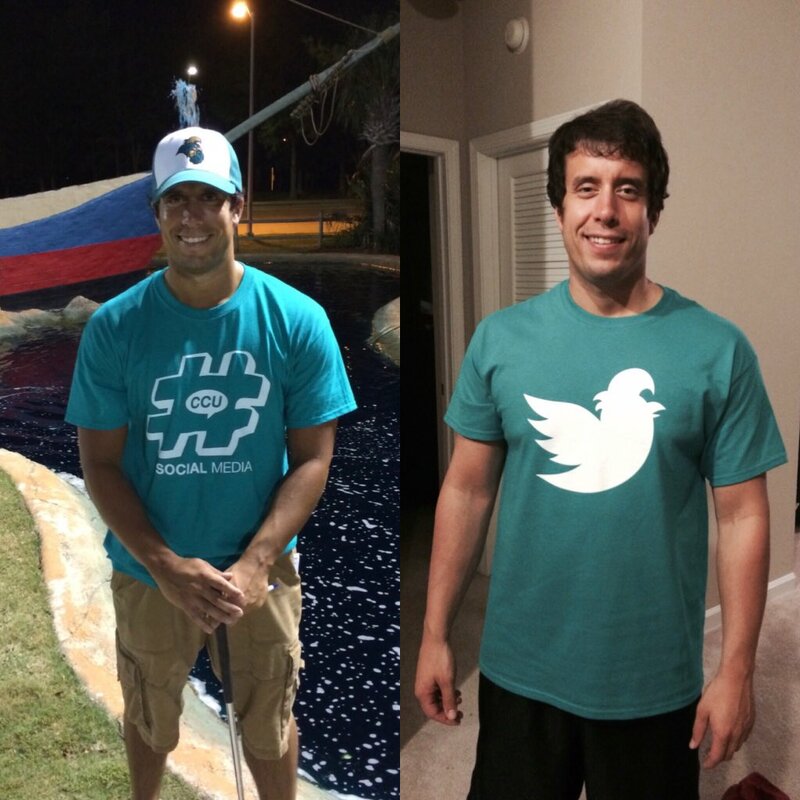 The past two #CCUSocialMedia t-shirts. I know you want a shirt. 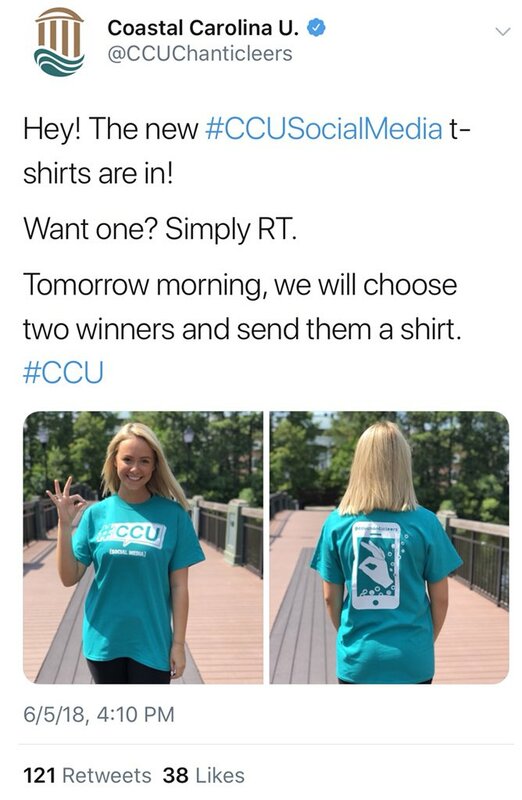 All you have to do is participate in #CCUSocialMedia to win one. Sorry, they won’t be available in stores to purchase. As for me, I am excited to wear my new #CCUSocialMedia shirt and continue to spread the brand! Don’t Blink. Today is significant because it marks the two week countdown until Thanksgiving. Today is also a big deal because it is the Thursday Rundown. As I like to say, let’s get started! Underwhelming Trump – I have to lead off the rundown by getting this off my chest: my admiration for Donald Trump is starting to wane a little bit. Four months ago, I wrote a post that was complimentary of the campaign he was running. Fast forward to the present and while I still respect what he has done, it has become apparent to me that major substance is lacking. I have watched all the GOP debates and it really seems like he says the same things over and over. He bypasses on the details. He drifts into irrelevancy when he talks about past business deals. Each debate I have watched I have paid close attention to Trump and each time I came away underwhelmed. However, more power to the guy for still leading the polls! 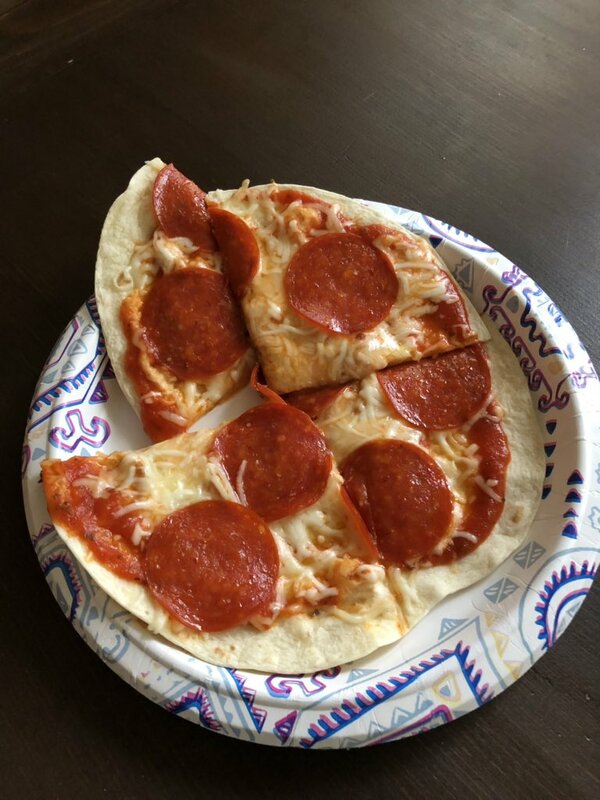 Fritos Chili Pizza One Year Later – As it is the one year anniversary of when I ordered the Papa John’s Fritos Chili Pizza, I thought I would just state my opinion that I am not surprised that 365 days later no other pizza franchises have followed suit with their own version of it. 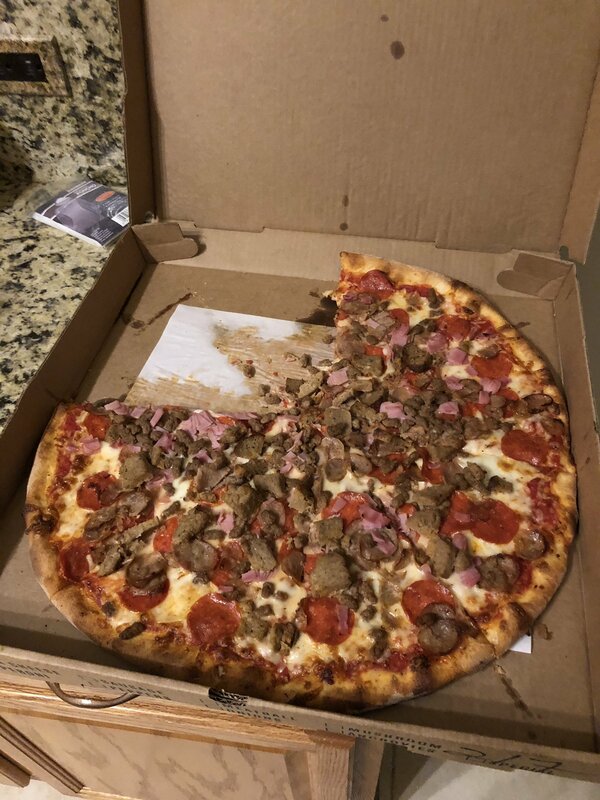 Despite good intentions, the pizza just didn’t work. Sure the taste itself wasn’t spectacular but the worst part about the experiment was eating a slice the next day. Soggy chips that are then refrigerated never turn out good. Two Interesting Documentaries – Sidney bought me an Apple TV for my birthday. Lately I have taken full advantage of the device, watching movies and documentaries. When it comes to the latter, I want to share the names of two decent ones I watched this week. I got a thrill entering the world of sleep paralysis with “The Nightmare.” The film interviews numerous folks who suffer from sleep paralysis while depicting their horrors as they share their experiences. As someone who has had sleep paralysis experiences before, I found it very interesting. Ever wonder if you have a long lost twin? The documentary I watched last night, “Twinsies,” tells the story of two twin girls who were adopted out of Asia. One went to France and one went to the United States. The French girl happened to see her American twin, who she had no idea existed, on a YouTube video. The two connected and started to Skype. The documentary chronicles the DNA tests that ensued, the endless questions that were raised, and the reunion that took place in Europe. Another Great Graphic – Last week I shared the stellar Halloween graphic that was made for our Coastal Carolina University social media accounts. 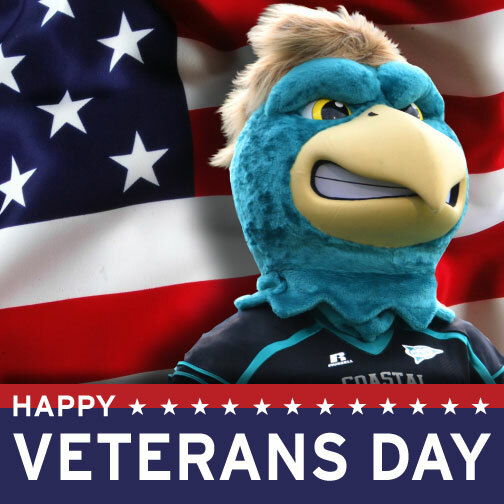 This week I want to show off the Veterans Day graphic that was created. Once again, our graphics team did a phenomenal job. Thank you Ron for designing this, it was very well-received by our #CCUSocialMedia audience. This fabulous Veterans Day graphic was made by designer Ron Walker. Wedding Update #12 – We are in the process of trying to choose the venue for our rehearsal dinner. Sidney and I want to get our restaurant selected so we can make a reservation and beat out the swarm of engaged couples that will sprout up over the holidays. Best way to make a quality decision? Treat yourself to dinner at each prospective location! 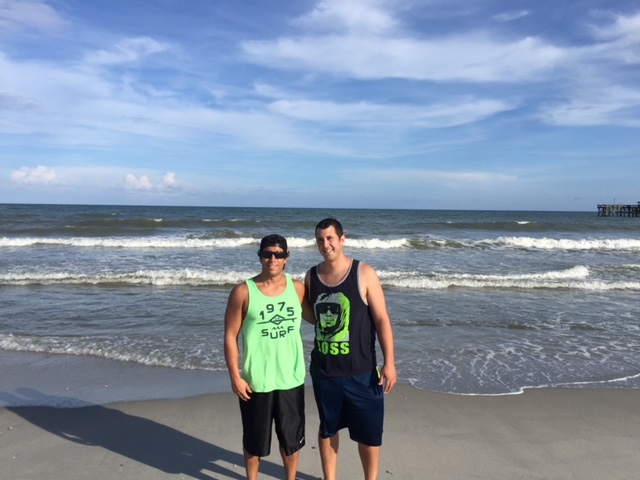 Last Friday we ate at Sea Captain’s House, a Myrtle Beach favorite that is on our short list. After we ate we were able to ask questions. To all my Myrtle Beach readers, Sidney and I would LOVE suggestions on other good places to consider. 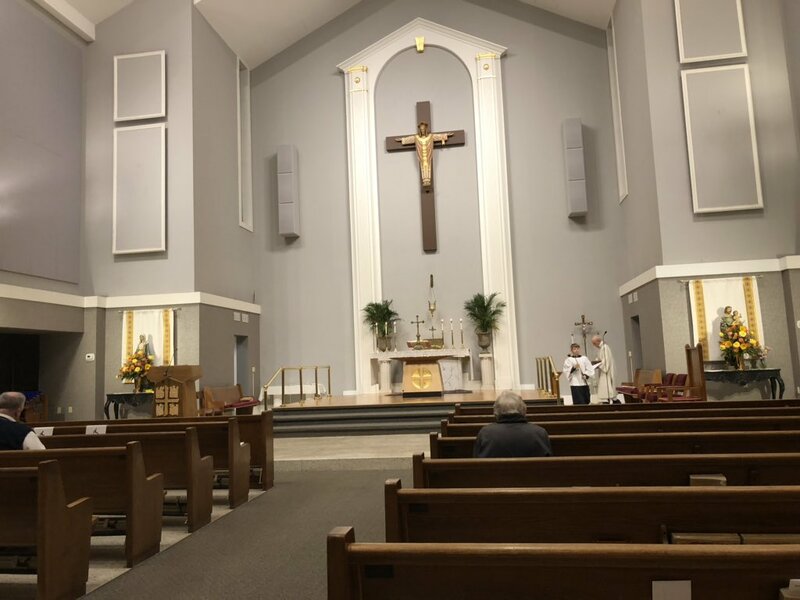 Keep in mind that we want a restaurant that isn’t too far from St. Andrew Catholic Church. Also, we had our fourth Pre-Cana meeting on Tuesday. We only have one meeting left but that will be on hold next week. Why? Well, our sponsor couple is graciously having us over solely for dinner! The books will be put away as they prepare a meal for the four of us. Sid and I love our sponsor couple! Have a great Thursday night! As always, thank you for reading. Don’t Blink. I have become a broken record stating that the part I like most about my job is interacting with college students on a daily basis. They help me reach my goals for our social media program and I do my best to help them as well. In an effort to attract more people to their services, especially students, many social media apps have a “college rep program.” The makers of these apps will recruit and train students to grow their social media service on their respective college campuses. 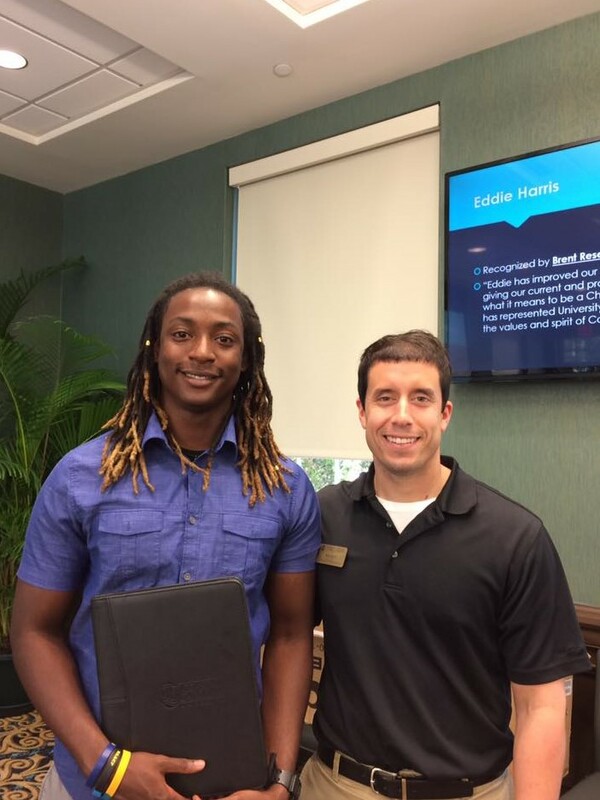 A few weeks ago I met with a student at Coastal named Emily. She had recently become one of these social media reps. However, she wasn’t a rep for one of the many apps that pop up for a few weeks and then disappear. Instead, she signed on with a popular app that has proven to have a little more staying power. I am talking about Yik Yak. Yik Yak is an app that makes a lot of folks working in higher education very nervous and uncomfortable. Emily needed my help. Up until our meeting, she was fulfilling her Yik Yak rep duties by catching up with students as they walked to class or entered the dining hall. It was an unofficial, hit-and-miss, guerrilla type strategy. Not that there was anything wrong with what she was doing, it was just that she was limited. She came into my office and asked that #CCUSocialMedia sponsor her. 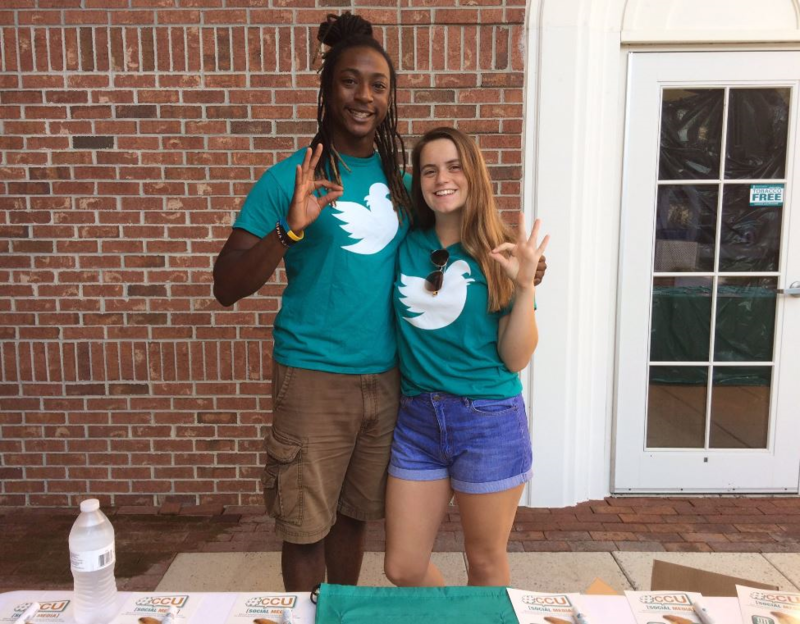 What does it mean to be sponsored at Coastal Carolina University? It means that a third party individual or group (such as Emily working for Yik Yak) must be backed by an official office on campus. The official capacity watches over the sponsoree and does what they can to help the third party reach their goals. Perhaps the most coveted advantage of a third party that is sponsored by a Coastal entity is that they receive tabling privileges out on Prince Lawn. Emily Little is a freshman from Mauldin, S.C.
During her pitch, Emily told me that her goal was not just to “recruit more members for the #CCU herd” but to also clean up our Yik Yak feed. Of course I brought up the Yik Yak Takeover I organized a year ago. I told her it worked great for the day but things went back to normal shortly thereafter. She countered that it would be a project she would be able to focus on for a much longer period of time as opposed to the one day we devoted to it. I then grilled her with questions about her role as a Yik Yak rep. I explained how tough of a decision it was for me to sponsor an individual who is working for a service that allows users to be so openly critical of CCU. 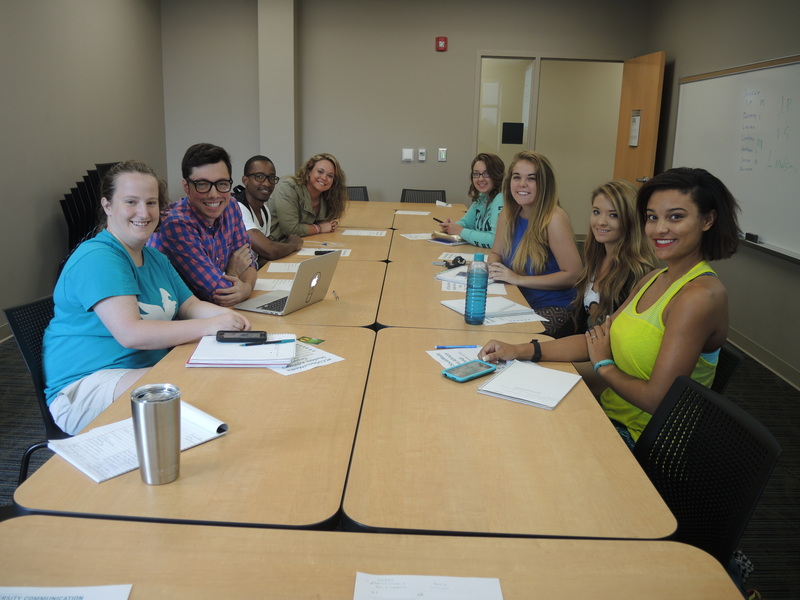 As one final vetting measure, I had Emily come in and talk to our #CCUSocialMedia Student Advisory Group about her plans. They interrogated her with more questions and comments than I did! With the approval of our Vice President for University Communication, I decided to sponsor her. For someone who had gone to great lengths to prove she wanted to help both Yik Yak and Coastal Carolina at the same time, I couldn’t refuse. After all, it was a great PR move. Students naturally think that all college institutions automatically despise Yik Yak. When they see a university actively working with the service, it sends a message of collaboration instead of fear and resentment. 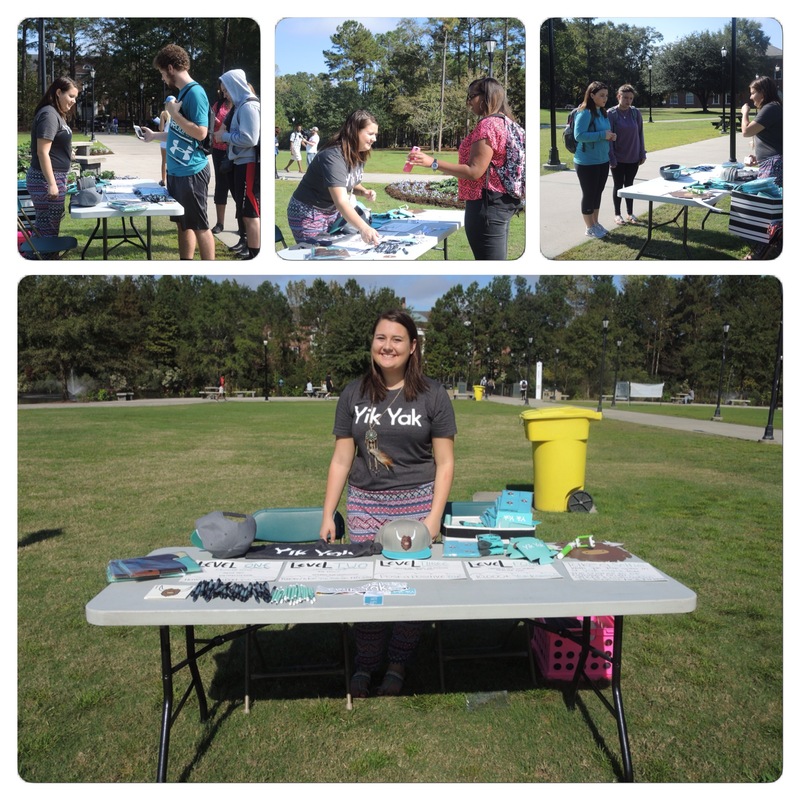 This past Friday, Emily had her first event on Prince Lawn. Offering items such as t-shirts, pens, masks, and extremely popular socks, her table was packed for the full three hours. 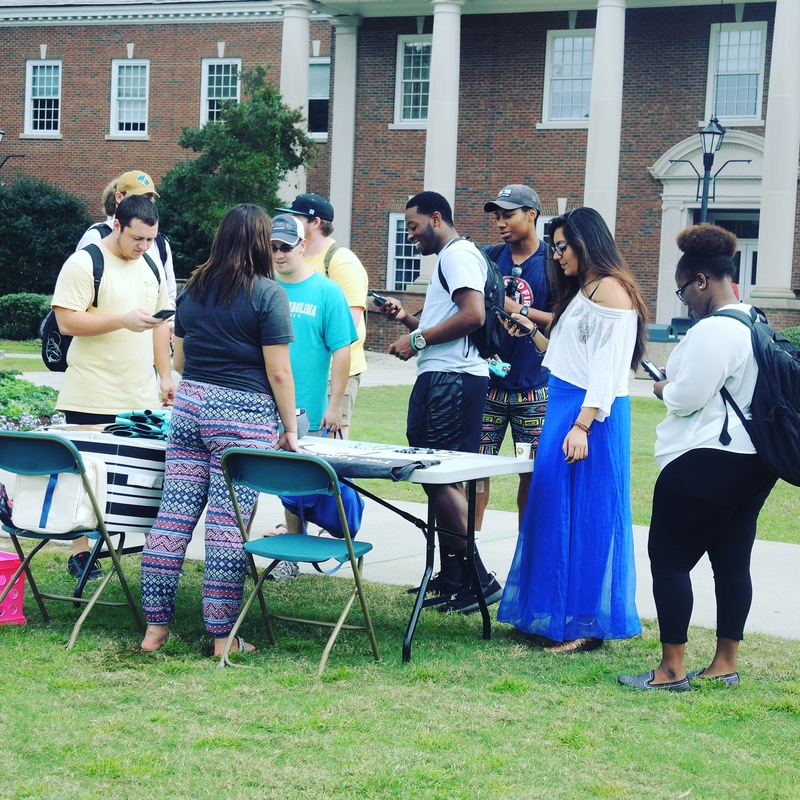 The merchandise was used to make both Yik Yak and CCU happy as students received the smaller promo items for signing up for the service and the more premium items for sending out positive Yaks. 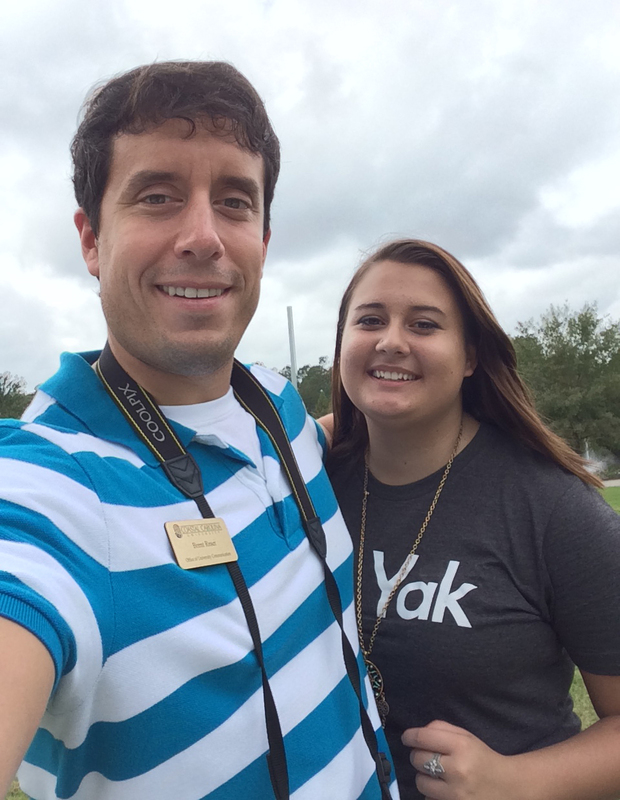 #CCUSocialMedia was successful in sponsoring Emily, a student rep for Yik Yak. As with our Yik Yak Takeover, the stream was filled with positivity. However, there was one major difference. Absent this time around was an effort by an unhappy minority to hijack the positive vibes. When we did the Takeover, we received pushback from some who hated the idea of CCU staff getting involved. With this a sole student-driven effort, we didn’t see anyone trying to combat the optimism. Emily and I at the Yik Yak table on Friday. #CCUSocialMedia tried to help out Emily more than just organizing her table and checking up on her. We devoted Instagram and Twitter posts on our main accounts during the event. I also sent our student videographer out to do a short story on Emily’s efforts. When I asked Emily at the end of the day if she was happy with how it all turned out, she said YES. Emily’s Yik Yak table was packed the whole day. When it comes to pushing your brand, it is important to think outside of the box. Sometimes this entails working with a rival brand that might seem counterproductive at first glance. We pulled this off by sponsoring someone working for Yik Yak. 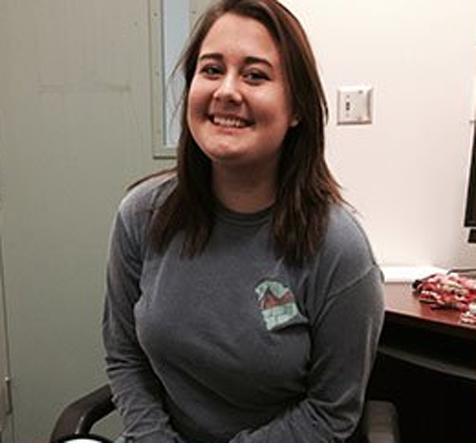 Of course it wasn’t just “someone working for Yik Yak”…it was one of our students. The fact that we got to help her was the best part of it all. Don’t Blink. 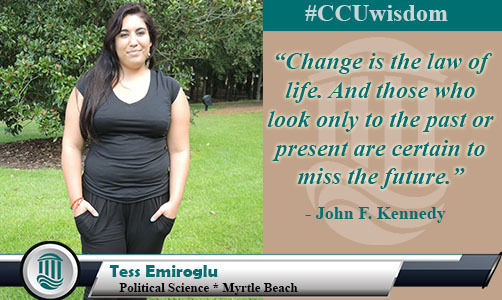 This semester I started a social media campaign at Coastal Carolina University titled #CCUwisdom. It is very simple. I ask students to provide me with quotes and each morning I tweet out one of the quotes over our main account. I also film them saying the quote and post that on Instagram. 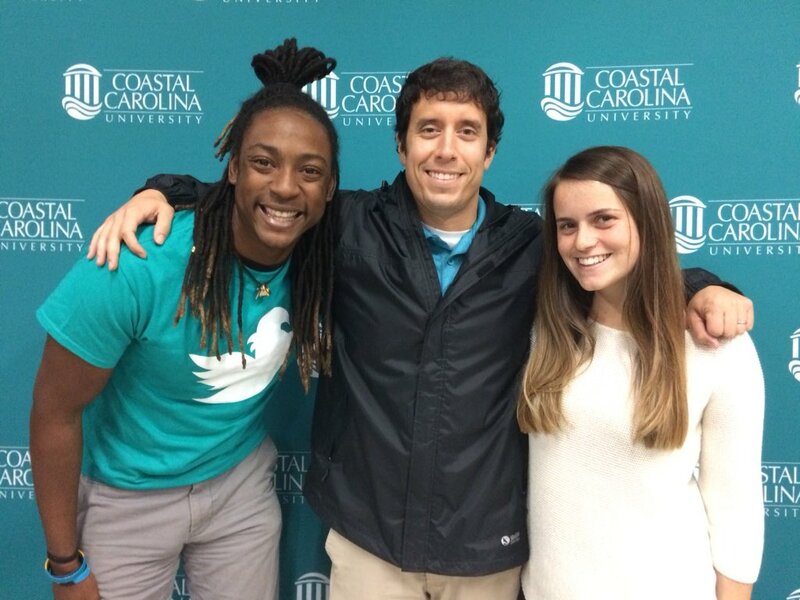 Follow #CCUSocialMedia for your behind-the-scenes pass to Coastal Carolina University. I am not much of a quote guy so I didn’t know how much personal enjoyment I would get out of the campaign. I implemented it primarily because quotes on social media generate retweets and favorites. Little did I know that I would be surprised. I must have listened to the wrong quotes growing up because the ones our students are providing me with actually contain a lot of substance and meaning. I grew up in awe of John F. Kennedy and because of this I knew several of his famous lines from speeches. However, at the end of last week I met with a student to film her quote. In the small talk before I recorded her, I asked her who her quote was from and she replied JFK. I thought I knew what was coming but when the student recited the quote my brain raced realizing that I had never heard this particular line before. Tess brought us this insightful quote from JFK. For all the faults I have, this is actually wisdom that I embrace and try to practice as much as possible. In under three decades of life, I have watched people react to change in different ways. The ones who I have watched accept this law of life thrive while those I have seen reject this law fall behind. I don’t really know if it is the positive or negative examples that have really motivated me to always be receptive of change. Even though I am accepting of change it doesn’t always mean that the implementation is easy. Perhaps this is a reason, besides stubbornness, as to why many people fail to welcome life’s most sure thing. Change brings with it bumps in the road and a learning curve. The transition is definitely not seamless. One thing I can’t do though is give myself too much credit for being open to change. If I want to eat, it is necessary that I am able to make 180 degree turns every day. When you have a career in social media you are constantly tracking the next trend and preparing yourself to react to the latest bombshell. You see, while some professions might allow for people to adapt a little more slowly, new media demands that you accept change RIGHT NOW. So basically my good habit of not hiding from change really isn’t because of my own merit but rather because of the job I work in. The second half of Kennedy’s quote is equally important. Wayne Gretzsky said (paraphrasing) that he skates to not where the puck is, but where it will be. If you dismiss impending change and believe that things will always be how they are, it is tough to make necessary adjustments and be successful in the long term. Of course it goes without saying that those stuck in the past are in an even more troublesome state. Change can be hard but it is absolutely necessary. Not only is it “the law of life” but it is also the key ingredient for progress and success. Don’t Blink.